Steven Victor Tallarico was born on 26 March 1948, in Yonkers, New York City USA, of German and Italian (father) and English and Polish (mother) descent, and to audiences is known as Steven Tyler, a singer, actor, songwriter, film score composer, as well as a television personality, perhaps best known for his involvement with the band Aerosmith..
How rich is Steven Tyler? Authoritative sources state that Steven’s net worth is estimated to be $130 million; the majority of his wealth comes from his involvement in the creation of the legendary rock band called Aerosmith, part of his career which now spans more than 50 years in the music industry. 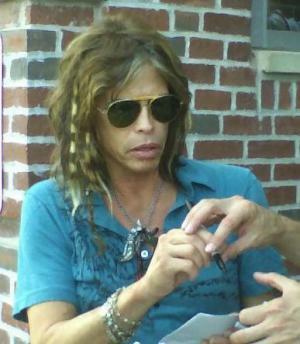 Steven Tyler was educated at Roosevelt High School, and then Quintano School for Young Professionals. He was fascinated by music, from an early age. Before the creation of the band, Steven Tyler wrote a single that would soon become one of the best songs performed by Aerosmith called “Dream On”. Steven Tyler met his future band members Joe Perry and Tom Hamilton at a local rock show in 1969, and later that year they decided to form a band. The group played their first show at the prestigious Max’s Kansas City club and attracted the attention of Columbia Records. In 1972, the band released a self-titled eponymous debut album that peaked at #21 on the Billboard 200, followed by a second studio album entitled “Get Your Wings” that was certified triple platinum by the RIAA and produced three singles. Around the time when Aerosmith went on their first tour, their songs began reaching wider audiences, and soon with the release of the single “Sweet Emotion” from their fourth album, the band achieved mainstream success. Even though the band was initially successful, the members of Aerosmith met with inner struggles. Constant touring, recording and, particularly, the intake of drugs were key factors behind the decline of Aerosmith in the late ’70s, when Steven Tyler’s addiction to heroin was at its peak. The band members reunited in 1984 but Tyler’s addiction was still an important issue that the group had to face. After he collapsed during one of their shows, other members of Aerosmith convinced Tyler to enter a drug rehabilitation facility and undergo treatment. By the end of the 1980s, the band was back on track and, more importantly, drug free. In 1987, Aerosmith released their ninth studio album called “Permanent Vacation” that is considered to be a marking point for the band. The album sold over five million copies in the United States and was certified Silver and Gold by the British Phonographic Industry. With the success of Aerosmith, came an increased net worth of its members as well. The band continued to record and release albums, and in 2001 Aerosmith was inducted into the Rock and Roll Hall of Fame. A year later, they released the album called “O, Yeah! The Ultimate Aerosmith Hits” that was followed by a worldwide tour with Kid Rock and Run D.M.C. During their music career, Aerosmith has released a total of fifteen studio albums and has almost 70 million album sales under their belt. In his personal Life, Steven lived with Julia Holcomb for three years in the late ’70s. Around the same time, a short relationship with Bebe Buell resulted in a daughter, who became the actress Liv Tyler. He was married to Cyrinda Foxe from 1978-87, and they have a daughter, ow model Mia Tyler. Steven secondly married Teresa Barrick(1988-2006) with whom he has a son and a daughter. He has since been in a relationship with Erin Brady. Steven Tyler currently owns several properties, including a $1.3 million home in Los Angeles, a house in New Hampshire, and a $5 million estate in Maui.